The Pure Fun 40 inch mini trampoline is a small bouncing play area that comes with a safety bar to hold on to as a way to stay safe while you play. In this detailed review, we will take a look at many of its features, its specifications, and even highlight a fun video showing how to enjoy it to its full capacity. Beyond that, we’ll also highlight a simple way to put it together to make it easier for you to enjoy it right away. Moreover, we’ll also showcase what the reviewers are saying about the product. Each of these review comments come from people with real experience using it. The Pure Fun 40 inch mini trampoline has a multitude of specifications and features that are worth understanding if you are interested in buying it. Let’s take a look at a few of the most important that you need to understand before making a purchase. These include the size, weight, the materials used in its build, and the capacity of the trampoline. Each of these specifications showcases a unique aspect of the trampoline, including the adjustable safety handle that keeps you from flying too wildly while you jump. 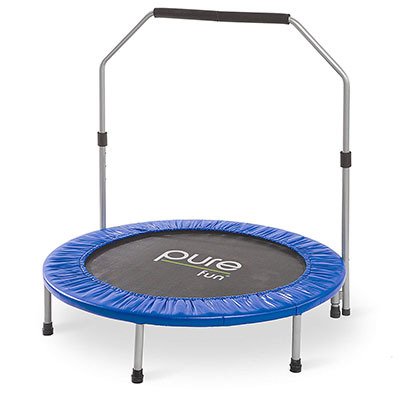 The Pure Fun 40 inch mini trampoline is designed primarily to be used as an exercise tool. Adults who want to increase their leg and ankle strength often try out this product. Nonetheless, children can also have fun with it by holding the handle and bouncing wildly. Moreover, it’s always a good thing to incorporate exercise into your kids’ lifestyle. As for its main purpose, this product is specifically designed for personal home use. You’ll discover a strong setting that can withstand regular use by one or two individuals. On the other hand, this might not be the best choice for gyms or professional use because they aren’t designed for that purpose. Before purchasing the Pure Fun 40 inch mini trampoline for your home, you should understand its pros and cons first. These concepts are very simple to understand and give you an insight into whether or not this exercise and play device is right for your needs. The assembly of the Pure Fun 40 inch mini trampoline is a relatively easy process for most people to handle. Most owners should be able to put a trampoline together on their own without professional help. Put together the frame first by laying out the pieces in a circle. Snap the frame pieces together to create the proper shape. Fit the legs of the trampoline into the proper holders. Tighten the screws on the holder into place to keep them tight. Flip over the frame and place the jumping mat inside. Attach the springs to the frame evenly by matching each spring with one on the opposite side. Turn the trampoline back over and stretch the cover over the springs. Insert the safety handle into the lock on the front of the trampoline. Adjust the height of the bar before screwing it tightly into place. Tighten all the screws and connectors tightly to keep the frame stable. If you are curious about how to use the Pure Fun 40 inch mini trampoline, this video will show you the best way to enjoy its bouncing fun. It also showcases a multitude of fun tricks that you can pull off, including flips and various jumps. That said, most reviewers were very positive about it. For example, most found the construction of the trampoline was durable enough to withstand many years of use. Others enjoyed the safety handle and said that it made the trampoline more enjoyable than it would have been without one. The Pure Fun 40 inch mini trampoline is a solid mid-priced trampoline that is a good choice for a variety of different people. While it might not be one of the absolute best choices on the market, it is more than worth the money. If you have any experience with it, don’t hesitate to reach out to us and let us know more about it.